If you're reading this, that means that you're probably pretty familiar with Oris. (Yes, I'm giving you points for being a RedBar member/follower here.) They make "real watches for real people" – their words, not mine – which translates into reasonable prices, solid designs and an almost unreal bang-for-the-buck value proposition. While they've been in business for over 100 years now (112, to be exact), they've been enjoying a bit of a renaissance of late thanks in no small part to their absolutely fantastic Divers 65 homage, which is pretty much a master class in how to do a proper re-issue. From the foundation laid by the first edition of the Divers 65, which was introduced in 2015, Oris has gone on to release a metric ton of dial options, and even a bronze case – the long since sold out Carl Brashear LE – all of which mark the owner as a collector-in-the-know. Really, you can walk into a room full of whale collectors rocking nuke-level horological firepower on their wrists and you wouldn't be out of place with a Divers 65, it's that good. But that's not what we're here to talk about. Even though the Divers 65 is the bell of Oris' ball, it's not as if their portfolio was bereft of a proper diver before it came along. In fact, Oris has been quietly nailing the dive watch game since the mid-90s with their distinctive TT collection, which has since morphed into the elegant Aquis. The Aquis is Oris' go-to diver for professionals, and it can had in a variety of dials and configurations, including a chronograph, a nifty regulator and a novel depth gauge. Personally speaking, the best part of the Aquis for me is that it's an entirely original, contemporary design that's 100% Oris. True, for some the integrated bracelet necessitated by the trademark lugs make the Aquis a non-starter, but for better or for worse, it's those lugs that make the watch. And like all of Oris' offerings, its almost too much of a value for its own good (most models can be had for under $2K). Of course, for this kind of money you're not getting in-house movements and high complications, but that was never what Oris was about; they seem to be just fine with that, and you should be too. For 2017 the Aquis received what those in the auto industry would refer to as a mid-cycle refresh, which thinned out those curvaceous lugs and streamlined the design language of the dial and the case. I find it to be an improvement overall, but if you disagree with me, I won't argue as the original Aquis was quite a looker, too. All of this brings us to Key Largo. Yes, that Key Largo. (...Montego, baby why don't we go... ARRRGHHH!!!) While you may be familiar with Oris, the Divers 65 and even the Aquis, I wonder if you're familiar with the work they do with various ocean-related conservation efforts around the world. For the past 7 years, Oris has been releasing limited edition watches that benefit worthy causes with a focus on reef and marine wildlife preservation. The first of these was the Great Barrier Reef LE, which was released in 2010 to benefit – wait for it – the Great Barrier Reef (okay, the Australian Marine Conservation Society, but still), which has seen an unprecedented decline in recent years. It was followed in short order by other divers that honored organizations such as Bluepeace in the Maldives, the Tubbataha Reef Project in the Philippines, the Red Sea Environmental Centre and even hammerhead shark conservation in conjunction with Pelagios Kaunjá. Part of the proceeds from the sale of all of these watches go directly to the organizations that they support, which is added to the already generous donation that Oris provides. So, as you have probably guessed by now thanks to the headline, the latest in this line of limited edition divers is the Staghorn Restoration Limited Edition, which is based on the current iiteration of the Aquis, and which was created to benefit the Coral Restoration Foundation. 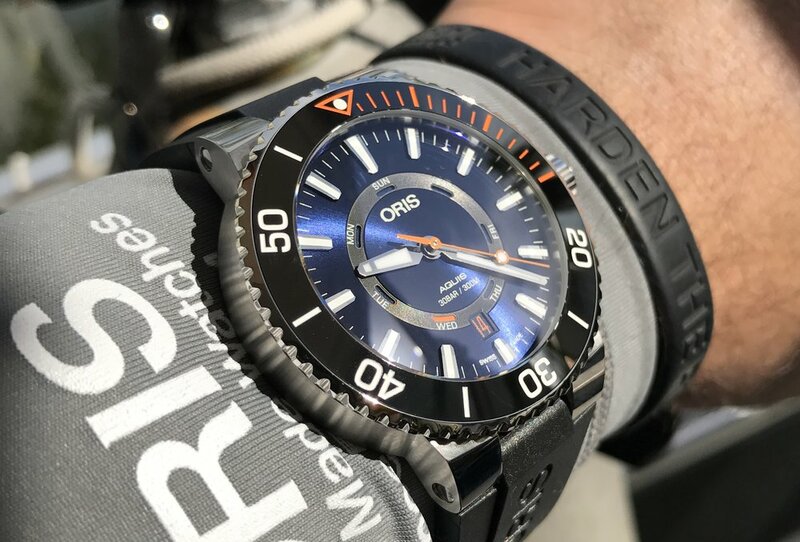 To introduce this watch – of which 2000 will be made – and to familiarize us with the work that the CRF does, Oris flew an international group of watch journalists to Key Largo, FL. Our mission: to dive with CRF team members and see firsthand the work that they do and learn why it's so vital to the health of the coral reef system, and marine ecology as a whole. The day began early with gear being stowed on the dive boat and liberal applications of reef-safe SPF, the latter of which had the effect of rendering several members of the press white as ghosts. It took approximately 45 minutes to motor 3 miles offshore to the CRF's expansive underwater coral nursery, where the endangered Staghorn coral is grown and harvested in a controlled environment. From here, it was a short trip to Pickles Reef, where the CRF has been successfully replanting Staghorn coral for the past 4 years. It was striking to see firsthand the difference between the planted coral, which is thriving, versus the bare, bleached section of the reef where the new planting is taking place. Of course, "planting" 20 feet under the waves is a bit different from planting a bush in your backyard, so we were treated to a lesson in aquatic horticulture the evening before at CRF's headquarters where staff members demonstrated the correct method to harvest the coral and then use a special epoxy to secure it to the reef. While it seemed straightforward enough, again, 20 feet under it's anything but. Still, the CRF relies in the main on volunteer divers to maintain their nurseries, so this instruction is vital. I'm pleased to report that our excursion was a success, with coral harvested and planted, though there were a couple of members of the press who lost their battle with seasickness. I'm also pleased to report that I kept my breakfast down (okay, dinner – I wasn't leaving anything to chance), though I'm not ashamed to admit that I came close to "feeding the fish" on more than one occasion. That said, in spite of the rocking waves and the changeable weather, I think it's safe to say that everyone involved came away from the experience with a greater appreciation for the efforts of the CRF and the unbridled beauty of our coral reef system. Not only were the press on hand, but also Oris Chairman, Ulrich Herzog and North American CEO, VJ Geronimo. Both men are as committed to saving the environment as they are to their company, which is refreshing indeed. In fact, it's worth noting that Mr. Herzog implored us to speak more to the CRF than to the watch we were ostensibly here to help introduce. Even so, I'd be remiss if I didn't spend at least a paragraph or two talking about the guest of honor. The Aquis Staghorn Restoration LE takes the Aquis formula and turns up the volume to 11. The dial is a deep sunburst blue to evoke the monde du silence, while the bright orange highlights that adorn the polished ceramic timing bezel, second hand and date complication recall the color of healthy staghorn coral (and also happens to be the last color that fades to blue as one descends). In a novel twist, the day of the week is indicated on a concentric dial which rings the center pinion and uses an orange-colored disc to highlight the day. This complication was first seen on the Aquis Great Barrier Reef Limited Edition II, and is used to excellent effect here as well. On the flip side, a beautifully engraved caseback depicts the staghorn coral in its natural environment, as well as the individual limited edition number. The stainless steel case sports a diameter of 43.5mm and is a smidge over 12mm thick. Water-resistance is rated to 300M, and under the hood ticks the Oris 735 calibre, which translates into a reliable Sellita SW220. The conservation theme also extends to the presentation box, which is made in part from regenerate algae. Yes, regenerative algae; Oris has left nothing to chance here. As for the rest of the trip, it's safe to say that when RedBar is involved, a certain measure of tomfoolery will take place, and here was no exception. "Van" pool karaoke (Miguel Seabra is an instigator par excellence), dive bar crawling (the CRF folks are excellent guides), actual karaoke (Sean of Worn & Wound has the pipes of an angel), Oris-branded snuff (pilfered from co-CEO Rolf Studer) and a liberally abused bar tab (thanks, VJ!) are all memories that hopefully will endure as long as the coral that we came to save. The Oris Aquis Staghorn Restoration Limited Edition will go on sale in north America in August with a MSRP of $2200 ($2400 on bracelet).